The basement. Oh, the basement. It's a sad excuse for additional living area right now, but thankfully there isn't much to deal with down there except taking out the existing drop ceiling and removing the icky tile floor. Both projects are on the docket for this coming weekend and the following weekend as well, so hopefully we can clear it out so the builder can start! The plan is for the builder to frame it up for drywall, insulate the walls & ceiling, have lighting and drywall installed, then everything will be painted and finally, we will have carpet installed. We plan to use our existing furniture, so that part is "free", per se. The plan is to put use our current sofa, chair & ottoman, sofa table & end table, plus our media stand and television. This is also the only room in the house that has any sort of measurable wall space, so we plan to put many of our large family photos that we currently have framed on the walls. Honestly, we are not sure if we're going to hang out downstairs, but we hope we do, since it's a lot of living space, that is currently not utilized. I imagine having movie night down there, and also being able to have Eames play down there with his friends, eventually. Eames has TONS of toys in his room, and we'd like to avoid that as much as possible in the new house. We also don't have many "large" toys, since our current home is miniscule. So any of those he accumulates can go down there. 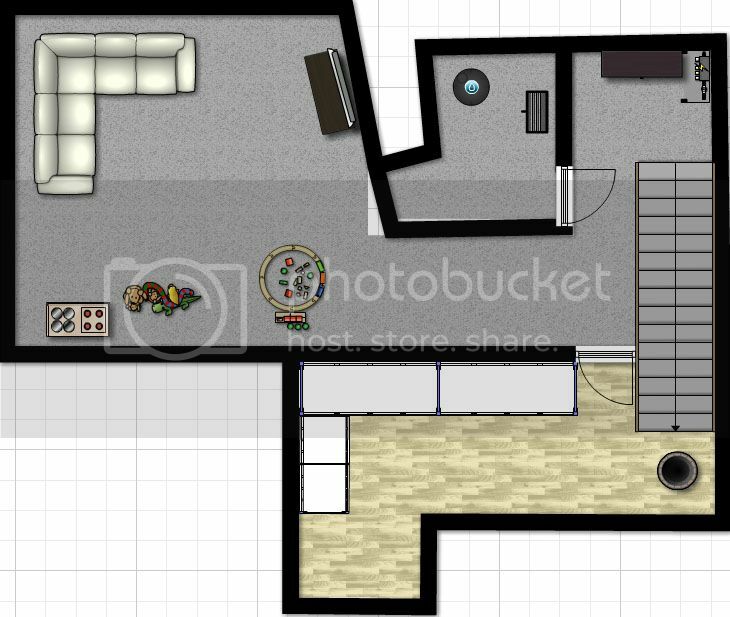 There are two rooms and they seem to be the exact footprint from the rooms above - living room, dining room & kitchen. The larger room is also home to our water heater and furnace, which will be walled in once they frame it out. The back room will be a laminate floor, which we took out of the upstairs kitchen, and Greg will be building shelving for storage. You will also note that under the stairs, is our well - yep, the house's well is INSIDE the house, which was a foreign concept to both Greg and I. It is not being used right now, as we recently hooked up to city water, but we plan to use it to water our lawn. That's about it down here - it's not huge, but with the open staircase from upstairs, we hope this area is a lot more inviting, and that we use it as a family room for relaxing and playing. A slightly off-topic comment: I'm confused about the angle of the fireplace; does it work better IRL than it does in the plan? Don't get me wrong; your house is a treasure. But I'm wondering if whatever was in the architect's mind worked out in 3D-land -- if you were to re-do the house, would you put the fireplace at an angle, or straighten it out? The house is so cool! I have yet to read everything, but I'm intrigued. Thanks for your comments - I love that you're reading along with our progress. The fireplace is absolutely on a strange angle, and I'm not sure if we were to re-do the house, what in the world we'd do. It adds a bit of character to the layout, and makes the living room seem bigger and more open to the rest of the first floor, and in the basement we are going to run a wall there anyway, so it may work just fine....but you make a good point! Moving the toys is a great idea. That's what we're doing with all of D's toys. He has books and a few small, quiet toys in his room. A couple puzzles, games, and books in a closet on the first floor, and all of his bigger, louder toy (and trains!) in the basement. It's easy for me to keep the main floors in guest-ready condition. The basement is kid central, so if friends with kids come over, we can hang out down there and I don't care if it gets messed up.